Mill-Kummissjoni Venezja: Malta demokrazija parlamentari? Meta tipprova tifhem dak li ntqal mill-Kummissjoni Venezja tal-Kunsill tal-Ewropa tirriżulta preokkupazzjoni waħda bażika: Malta demokrazija parlamentari? Meta tgħarbel l-opinjoni li kienet ippubblikata iktar kmieni din il-ġimgħa tasal għal konkulżjoni loġika: id-demokrazija parlamentari f’Malta hi prattikament ineżistenti. Minflok għandna ċentraliżmu demokratiku bil-Kabinett jiddetta lill-Parlament. Dik li fuq il-karta hi l-ogħla istituzzjoni tal-pajjiż hi fil-fatt sudditu tal-Kabinett. Wasal iż-żmien li l-Parliament jieħu l-mazz f’idejh. Din hi l-qalba ta’ dak li għandu jkun ikkunsidrat f’riforma kostituzzjonali massiċċa li hi meħtieġa. Dan mhu xejn ġdid għalina f’Alternattiva Demokratika. Jekk wieħed jgħarbel il-manifesti elettorali, stqarrijiet u artikli minn esponenti ta’ AD tul is-snin hu ċar li l-parti l-kbira ta’ dak li tgħid il-Kummissjoni Venezja ġie indirizzat minn Alternattiva Demokratika. Imma dak li qalet AD ġie repetutament injorat mill-klassi politika diriġenti li kontinwament injorat il-ħtieġa ta’ bidla. Qatt ma kellhom rieda tajba li jindirizzaw il-poteri kolonjali tal-gvernatur li fil-parti l-kbira tagħhom għaddew għand il-Prim Ministru u rabbew l-għeruq fil-kostituzzjoni u l-liġijiet tagħna. Il-mentalità li min jirbaħ ikaxkar kollox trid tispiċċa u tinbidel f’waħda fejn kull settur tas-soċjeta ikollu rwol fit-teħid tad-deċiżjonijiet u fejn il-Parlament ma jibqax servili lejn il-Kabinett imma jkun kapaċi li jieqaf fuq saqajh u jagħti direzzjoni hu lill-Kabinett. Fl-opinjoni tiegħi mhux korrett li jingħad li d-demokrazija f’Malta hi pprattikata fuq il-mudell ta’ Westminister. Iktar inkunu korretti jekk nirrealizzaw li l-mudell hu dak imfassal mill-Uffiċċju tal-Kolonji imma mlibbes ilbies kostituzzjonali iktar riċenti: gvernatur liebes ta’ Prim Ministru. Il-problema bażika hi li l-Parlament Malti ġie ikkastrat mill-PNPL. Hu Parlament ineffettiv għax m’għandux ir-rieda politika li jġiegħel lill-Gvern jagħti kont ta’ għemilu: la l-Gvern tal-lum u l-anqas lil dawk li ġew qabel . Il-Kummissjoni Venezja tidħol fil-qalba tal-materja meta tipponta lejn żewġ punti fundamentali li jeħtieġ li jkunu indirizzati. Id-defiċjenza kostituzzjonali bażika f’Malta hi li l-Prim Ministru għandu f’idejh poteri kbar, wirt mill-gvernaturi kolonjali u f’ħafna każi bla jedd tal-Parlament li jara x’inhu għaddej. Dan iżeblaħ dik li nirreferu għaliha bħala demokrazija parlamentari u hu l-kawża tal-problemi kollha indirizzati mill-opinjoni tal-Kummissjoni Venezja. It-tieni problema hi l-membri parliamentari servili lejn l-eżekuttiv dejjem ifaqqsu: jistennew it-tqassim mill-Prim Ministru ta’ ħatrijiet intenzjonati biex iżommuhom okkupati u allura ma jkollomx il-ħin biex isaqsu u jgħarblu dwar il-ħidma tal-Gvern. Dawn mhumiex problemi li ħoloqhom Joseph Muscat. Inħolqu minn ta’ qablu u ġew ipperfezzjonati tul is-snin biex ikun assigurat li ħadd ma jazzarda jaħseb b’moħħu. Il-ftit eċċezzjonijiet jippruvaw ir-regola! L-aħħar tibdil sar mill-Parlament b’maġġoranza Laburista elett fl-2013 meta sar tibdil f’diversi liġijiet biex ikun possibli li membri parlamentari (laburisti) jkunu jistgħu jinħatru f’diversi karigi, bi ħlas sostanzjali. Dan jassigura li ħadd minnhom ma jiftaħ ħalqu biex ikun kritiku tal-Gvern għax kollha għandhom idhom fil-borma. Lawrence Gonzi ipprattika dawn l-affarijiet, filwaqt li Joseph Muscat irfina s-sistema. L-opinjoni tal-Kummissjoni Venezja titkellem dwar bosta materji oħra ta’importanza kbira. Imma fl-opinjoni tiegħi, fl-aħħar, dak kollu li jingħad hu rifless f’punt wieħed : it-tmexxija għandha tkun f’idejn il-Parlament li għandu jibni demokrazija parlamentari ta’ vera u jġiegħel lill-Kabinett jagħti kont ta’ egħmilu kontinwament. Il-kumplament ikun il-konsegwenza loġika ta’ dan. Venice Commission opinion: is Malta a Parliamentary Democracy? Reading between the lines of the Council of Europe Venice Commission’s opinion on Malta, one basic preoccupation sticks out: is Malta a parliamentary democracy? Perusal of the opinion, released earlier this week, leads to one logical conclusion: parliamentary democracy in Malta is practically nonexistent. Democratic centralism reigns supreme, with the Cabinet dictating to Parliament. What on paper is the “highest institution in the land” is in fact a vassal of Cabinet. Is it not about time that Parliament takes control? This is the crux of the matter which needs to be addressed by a major constitutional overhaul. There is nothing new to Maltese Greens in all this. Going through Green election manifestos, statements and articles throughout the years clearly shows that most of the points raised by the Venice Commission’s opinion have been repeatedly addressed by Alternattiva Demokratika-The Green Party. Yet these green proposals have been ignored time and time again as the alternating ruling political classes have continuously manifested a glaring lack of good will to embrace change and remove the vestiges of colonial rule which are still entrenched in Malta’s constitutional and legal setup. The “winner takes all” mentality has yet to give way to one where all sectors of society are involved in decision-taking and where, in particular, Parliament is not subservient to the tenant at the Auberge de Castille, but is capable of holding Cabinet on a leash. It is, in my opinion, incorrect to state that democracy in Malta is practiced on the basis of a Westminister model. It is rather a Colonial Office model camouflaged in modern constitutional clothing: a governor in prim-ministerial clothing. The basic problem lies in the fact that Malta’s Parliament has been castrated by the PNPL. It is an ineffective Parliament, as there is no political will to hold any government to account: neither the present nor any previous other. The Venice Commission’s opinion goes to the heart of the matter when it points out two fundamental issues that need to be addressed. The basic constitutional deficiency in Malta is an all-powerful Prime Minister who has constitutionally inherited all the powers exercised by the colonial governors, many times without parliamentary oversight. This makes a mockery of our so-called parliamentary-democracy and is the source and cause of all the problems addressed by the Venice Commission opinion. The second basic problem is a never-ending supply of servile Members of Parliament who look forward to the sinecures distributed by the Prime Minister to all (government) backbenchers, thereby ensuring that all or most of them are at his beck and call. They are thus kept busy and have no time to ask questions and demanding answers, thereby holding the executive to account. These problems have not been created by Joseph Muscat. They have, however, been specifically designed by his predecessors in office, red and blue, and tweaked over the years to ensure that at no point would it be possible for anyone to upset the applecart. The few exceptions prove the rule. The latest adjustments to the system were made by a Labour-controlled Parliament after the 2013 elections as a result of the amendments to various laws making it possible to assign various responsibilities, against substantial payments, to practically all Labour parliamentary backbenchers. This ensures that they each and every government backbencher is not in a position to call the government to account as they all have a finger in the pie! Lawrence Gonzi had also practised the above, while Joseph Muscat perfected the system. The Venice Commission opinion speaks on various other important topics. In my humble opinion, at the end of the day it only boils down to one point: Parliament should take full control: it should construct a real parliamentary democracy and hold the tenant at the Auberge de Castille and his associates to account, continuously. All the rest will necessarily follow. Going through the Council of Europe Venice Commission report leads to one logical conclusion: this is no parliamentary democracy. It is in fact an exercise in democratic centralism with Cabinet dictating to Parliament which in turn obliges. There is nothing new in all this. Going through Green electoral manifestos, statements and articles throughout the years clearly shows that most of the points raised by the Venice Commission report have been addressed by Alternattiva Demokratika. The proposals made have been ignored time and again as the alternating ruling political classes have continuously manifested a glaring lack of good will. The heart of the problem lies in Parliament which has been castrated by the PNPL. It is ineffective as there is no political will to hold any government to account: neither the present nor any previous other. The Venice Commission report goes to the heart of the matter when it points out two particular issues. The basic constitutional deficiency is an all powerful Prime Minister who constitutionally has inherited all the powers exercised by the colonial governors, many times without parliamentary oversight. This makes a mockery of our so-called parliamentary-democracy. The second basic problem is the servile members of parliament elected who look forward to the sinecures distributed by the Prime Minister to all (government)backbenchers thereby ensuring that all of them (or most of them) are at his beck and call. The problems have not been created by Joseph Muscat or Adrian Delia. They have however been specifically designed by their predecessors and tweaked over the years to ensure that at no point would it be possible for anyone to upset the applecart. The latest adjustments to the system were made by a Labour controlled Parliament after the 2013 elections as a result of the amendments to various laws making it possible to assign executive responsibilities to practically all parliamentary backbenchers. This ensures that they each and every government backbencher is not in a position to call government to account as they all have a finger in the pie! Is-sit tal-Ministeru tal-Ġustizzja jindika b’mod ċar li l-Att XIII tal-2017 imsejjaħ Att dwar l-Istandards fil-Ħajja Pubblika għadu ma daħalx fis-seħħ. Din il-liġi irċiviet il-kunsens tal-President tar-Repubblika nhar it-30 ta’ Marzu 2017 wara li damet perjodu twil pendenti fuq l-aġenda tal-Parlament. Jidher li għad baqgħalna x’nistennew, għax il-partiti politiċi fil-parlament ma tantx jdher li għandhom għaġla. Il-liġi tipprovdi għall-ħatra ta’ Kummissarju dwar l-Istandards fil-Ħajja Pubblika. Dan il-Kummissarju jista’ jkun approvat biss kemm-il darba jikseb il-kunsens ta’ żewġ terzi tal-membri parlamentari. Fi ftit kliem irid ikun hemm qbil dwar il-ħatra tiegħu jew tagħha bejn il-Gvern u l-Opposizzjoni li, sa fejn naf jien, għandhom ma qablux. S’issa ħadd ma jaf xejn, l-anqas jekk ġewx proposti ismijiet, minn min u x’kienet ir-reazzjoni dwarhom. Il-liġi approvata tapplika għall-Membri kollha tal-Parliament, inkluż il-membri tal-Kabinett. Tapplika wkoll għal dawk il-persuni maħtura f’posizzjoni ta’ fiduċja (position of trust) fil-Ministeri u s-Segretarjati Parlamentari. Meta iktar kmieni matul din il-ġimgħa iltqajt mal-Ispeaker tal-Kamra tar-Rappreżentanti, l-Onorevoli Anġlu Farrugia, jiena emfasizzajt li dan id-dewmien biex tkun implimentata din il-liġi dwar l-imġieba xierqa tal-Membri Parlamentari u dawk maħtura f’posizzjoni ta’ fiducja qiegħed jibgħat messaġġ ċar ħafna: li l-Membri Parlamentari m’għandhom l-ebda ħeġġa biex iwieġbu għal egħmilhom. Jiena niftakar lill-Ispeaker, xi snin ilu, jemfasizza li hu ma kienx sodisfatt mill-kontenut tad-dikjarazzjonijiet tal-assi sottomessi minn uħud mill-Membri Parlamentari. Issa għandu l-għodda biex jinvestiga dwar il-veraċitá ta’ dawn id-dikjarazzjonijiet imma sfortunatament m’huwiex jitħalla jagħmel użu minnhom! Il-Membri Parlamentari għandhom jagħtu kont ta’ egħmilhom, iżda l-fatt li l-liġi dwar l-Istandards fil-Ħajja Pubblika għadha ma daħlitx fis-seħħ qiegħed jostakola dan milli jseħħ. Meta tħares lejn dan in-nuqqas ta’ implimentazzjoni tal-liġi waħdu tista’ tinterpretah bħala tkaxkir tas-saqajn mill-Membri Parlamentari u l-mexxejja tagħhom li jippreferu ma jitqegħdux taħt il-lenti tal-iskrutinjun pubbliku. Imma meta dan kollu tqisu fil-kuntest tar-rapport annwali tal-Ombudsman għas-sena 2017 huwa ċar li dan it-tkaxkir tas-saqajn m’huwiex limitat iżda hu mifrux ħafna. Id-dritt tal-aċċess għall-informazzjoni dwar il-ħidma tal-amministrazzjoni pubblika qiegħed taħt assedju. Il-kontabiltá u it-trasparenza m’humiex slogans. L-anqas huma negozjabbli. Huma valuri fundamentali li jiffurmaw parti essenzjali mis-sisien tal-istat demokratiku. Jiena tlabt lill-Ispeaker biex jiġbed l-attenzjoni tal-Kumitat tax-Xogħol tal-Kamra li dan it-tkaxkir tas-saqajn biex ikun implimentat l-Att dwar l-Istandards fil-Ħajja Pubblika mhuwiex aċċettabbli. Huwa essenzjali li l-liġi tkun implimentata malajr kemm jista’ jkun jekk iriduna nemmnu li għall-partiti politiċi fil-parlament il-kontabilitá tfisser xi ħaga. B’żieda mar-responsabbiltá li jinvestiga l-imġieba kemm tal-Membri Parlamentari kif ukoll dik tal-persuni ta’ fiduċja, il-Kummissarju għall-Istandards fil-Ħajja Pubblika ser ikollu ukoll l-inkarigu li jfassal kemm il-linji gwida kif ukoll ir-regolamenti proposti dwar l-attivitá tal-lobbying. Dwar din l-attivitá b’implikazzjonijiet etiċi sostanzjali l-partiti politiċi fil-Parlament ma qablux meta din il-liġi kienet qed tiġi ikkunsidrata quddiem il-Kumitat Parlamentari għall-konsiderazzjoni tal-abbozzi ta’ liġijiet. Bħala riżultat ta’ dan Il-materja intefgħet f’ħoġor il-Kummissarju dwar l-Istandards fil-Ħajja Pubblika li meta jinħatar ser ikun hu li jkollu jfassal kemm il-linji gwida kif ukoll r-regolamenti proposti. Il-lobbying hi attivitá essenzjali fil-ħajja pubblika. Jeħtieġ iżda li issir b’mod li jkun assigurat illi d-deċiżjonijiet mittieħda mill-politiċi jkunu kemm trasparenti kif ukoll b’rispett sħiħ lejn r-regoli bażiċi tal-etika. Il-lobbying huwa ta’ influwenza kontinwa fuq id-deċiżjoniiet li jittieħdu. Huwa essenzjali li dan issir b’mod mill-iktar trasparenti biex ikun ċar għal kulħadd dwar liema interessi jkunu qed jiġu mmexxija l-quddiem. Dan bla dubju jfisser li ikun meħtieġ il-pubblikazzjoni ta’ ammont mhux żgħir ta’ informazzjoni li presentement hi fil-pussess ta’ membri tal-Kabinett u li ġeneralment tibqa’ fil-files – meta tkun miktuba. Din hi informazzjoni li ġeneralment tkun il-bażi għall-azzjonijiet u d-deċiżjonijiet li jittieħdu. Bla ebda dubju, il-linji gwida u r-regolamenti dwar il-lobbying iridu jindirizzaw u jirregolaw x’jista’jagħmel membru tal-Kabinett meta jispiċċa mill-ħatra, materja magħrufa bħala revolving door policy. Dan minħabba li s-settur regolat mill-Ministru jkollu għatx għal informazzjoni (kunfidenzjali) li dan ikun kiseb kemm ikun ilu fil-ħatra kif ukoll għall-kuntatti u influwenzi akkumulati fuq dawk li jieħdu d-deċiżjonijiet. Xi drabi għaldaqstant meta Ministru jew Segretarju Parlamentari, hekk kif itemm il-ħatra tiegħu ikun offrut impieg f’dak l-istess settur li ftit qabel ikun dipendenti minnu jeħtieġ li nieqfu ftit. Dan ovvjament għax miegħu iġorr aċċess akkumulat kemm għal informazzjoni miksuba kif ukoll għal kuntatti u influwenza fuq il-proċess deċiżjonali. Il-linji gwida u r-regolamenti jridu jistabilixxu kemm jeħtieġ li jgħaddi żmien qabel ma dan ikun jista’ jseħħ. .
Huwa dan kollu li qed nistennew. Hemm ħafna li jeħtieġ li jsir imma ma jidher li hemm l-ebda impenn biex dan isir. The website of the Ministry of Justice clearly indicates that Act XIII of 2017 entitled Standards in Public Life Act is not yet in force. This statute received Presidential assent on 30 March 2017 after an elephantine gestation period. It seems that we are in for a long wait as the parliamentary political parties do not seem to be in any hurry. 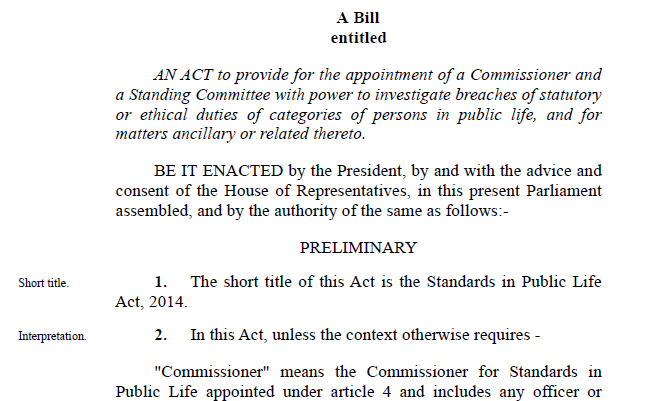 The Act provides for the appointment of a Commissioner for Standards in Public Life. The Commissioner can only be appointed if two-thirds of Members of Parliament agree with the nomination, and as far as I am aware there has been no agreement so far between Government and Opposition on the matter. The name or names proposed to date are not in the public domain. The Act applies to all Members of Parliament, including the members of Cabinet. Moreover, it also applies to those appointed to a position of trust in Ministries and Parliamentary Secretariats. When I met the Speaker of the House of Representatives, the Hon Anġlu Farrugia, earlier this week, I emphasised the fact that the delay in implementing this legislation on the ethical behaviour of Members of Parliament and those appointed in positions of trust is sending one clear message: that Members of Parliament are not that eager to be accountable for their actions. I do remember the Speaker – some years back – emphasising the fact that he was not satisfied with the contents of the asset declarations submitted annually by some MPs. He now has the tools to investigate the veracity (or otherwise) of such declarations but is, unfortunately, being prevented from doing so. MPs should be accountable for their actions, but the non-implementation of the Standards in Public Life Act is preventing such accountability. On its own, this lack of implementation could be interpreted as a reluctance of MPs and their leaders to be personally placed under the spotlight of public opinion. However, when viewed in the context of the 2017 Ombudsman’s annual report, it is very clear that this reluctance is widespread. The right of access to information on the workings of the public administration is under siege. Accountability and transparency are not slogans and, moreover, they are non-negotiable. They are fundamental values which underpin the democratic state. I have asked Mr Speaker to draw the attention of the House Business Committee to the fact that this procrastination in implementing the Standards in Public Life Act is not acceptable. Its implementation is a must if we are to believe that the commitment of parliamentary political parties goes beyond slogans. In addition to investigating the behaviour of Members of Parliament and that of people appointed to positions of trust, the Commissioner for Standards in Public Life will have the task of drawing up guidelines and a proposal for regulations on lobbying activities. This is another ethical minefield in respect of which there was no agreement between the parliamentary political parties when the draft legislation was under consideration in the Parliamentary Committee for the Consideration of Bills. As a result, instead of spelling out the required regulatory regime, the matter was postponed and added to the responsibilities of the future Commissioner for Standards in Public Life, whoever he or she may be. Lobbying is an essential and unavoidable element of public life. However, it has to be placed under the spotlight to ensure a fuller transparency of the decisions taken by the holders of political office. In addition to subjecting lobbying to clear transparency rules, it is essential that the ethical issues linked to lobbying are addressed forthwith. Lobbying continually influences decision-making. It is imperative that transparency rules are applied to lobbying so that it be clear to one and all as to whose interests are being advanced and defended. This would undoubtedly include the publication of a substantial amount of information to which Cabinet Ministers are currently privy, which information (generally) forms the basis for their actions and decisions. Undoubtedly, lobbying guidelines and regulations have to address the issue of revolving doors recruitment, as a result of which politicians may be available for sale at the taxpayers expense. A policy addressing the issue of revolving doors recruitment would also regulate the cooling-off period required for a Minster or Parliamentary Secretary to take up employment (after termination of office) in the sector which was subject to his regulation authority. This is what we are waiting for. Like Samuel Beckett’s characters in his “Waiting for Godot”. Godot never arrives. A Constitutional Convention is long overdue. It has been on the public agenda for years. Over the years, Malta’s Constitution has been patched up several times in order to resolve political issues arising at that particular point in time. It is about time that the Constitution is considered in its entirety in order to ensure that it serves the needs of the nation now and in the foreseeable future. An overhaul would certainly be in order. One major issue which, in my view, needs to be addressed is the curtailing of the executive’s power over the composition, set-up and running of authorities and institutions so that these can begin functioning properly. Rather than the executive ceding power, as Minister Owen Bonnici stated recently when piloting the debate on the Bill that seeks to introduce limited screening of public appointments, it means that Parliament should rediscover its proper functions and claim back its authority. This is the basic flaw in Malta’s Constitutional set-up. Malta is described as a Parliamentary democracy and, on paper, Parliament does have the power to decide but, over the years it has been reluctant to upset the current balance of power that favours Cabinet over Parliament. Unless and until there is a will to address this, no headway can be made and any proposed changes will necessarily be cosmetic in nature. Currently, the focus of public debate is on the functioning of the institutions of the state. This debate has been going on for some time but has gathered steam as a result of the obvious inertia observed over many years. The principal issue is the manner in which major public appointments are made. Unfortunately the public debate is sometimes derailed. 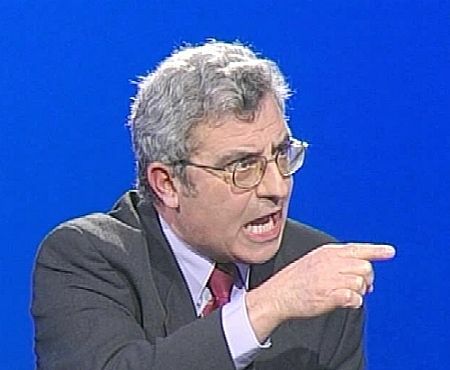 The debate on the Attorney General’s office, for example, should rather be on the functions of the office than on Dr. Peter Grech, the current incumbent. In particular, Parliament should examine whether the multitude of responsibilities added to the office of the Attorney General over the years have diluted its Constitutional responsibilities. One detailed proposal on the hiving off of responsibility for public prosecutions was made in the Vanni Bonello-led Justice Reform Commission, many moons ago. So far, no action has been taken. I think that by now it is clear to all that Parliament, on its own, will not deliver on the reform required because such reform, if properly carried out, will upset the manner in which political power is exercised in these islands. The basic Constitutional set-up underpinning the 1964 Constitution, notwithstanding the multitude of changes carried out throughout the years – including the 1974 change from a Constitutional Monarchy to a Republic – is still substantially in place. On Independence, in 1964, most of the powers of the British sovereign, then exercised through the Governor, were handed over to the Prime Minister, subject to the theoretical oversight of Parliament. For over 50 years, Parliament has been reluctant to upset the apple-cart and no Prime Minister has ever had the courage to propose the curtailment of his own powers and handing them over completely to Parliament, which is where they belong in a Parliamentary democracy. Nor has Parliament ever taken the initiative: its composition prevents it from acting in such a manner. The current large size of the Cabinet, coupled with the nomination of backbench MPs on the government side to various posts and sinecures, is a clear declaration of intent. Keeping backbench MPs happy and occupied reduce the likelihood of them asking too many questions. This has been going on for some time: in fact the Gonzi administration acted in a manner very similar to the current administration in this respect. This, in my view, is the crux of the whole issue which Parliament cannot and will not resolve on its own. It needs a vibrant civil society (not a fake one represented by a couple of non-entities) which can prod and guide it until it embarks on the path where real political power is channelled back to where it really belongs. This is the real reason why electoral reform has always been left on the back burner, as it is only through fair electoral reform that results in a different Parliamentary format whereby Parliament can start to think outside the box in which it is currently restrained. Illum il-ġurnata, diversi jitkellmu dwar “sostenibilitá” u dwar “l-iżvilupp sostenibbli”. Sfortunatament, bosta drabi ma jkunux jafu x’inhuma jgħidu. Bħala riżultat jispiċċaw iwasslu messaġġi żbaljati. Mela, ejja nibdew minn hawn. Meta nitkellmu dwar sostenibilitá inkunu qed nirriferu lejn dak li nagħmlu. Dan ikun sostenibbli kemm-il darba, d-deċiżjonijiet tagħna ma jippreġudikawx lil ġenerazzjonijiet futuri milli huma ukoll ikunu jistgħu jieħdu d-deċiżjonijiet tagħhom. Min-naħa l-oħra, l-iżvilupp sostenibbli hi t-triq li permezz tagħha nistgħu noqorbu u eventwalment naslu viċin li nkunu sostenibbli. Fi ftit kliem is-sostenibilitá tħares fit-tul. Dan kollu ma jikkonċernax biss l-ambjent. Imma jiġbor flimkien kemm il-politika ambjentali, kif ukoll dik ekonomika, il-politika soċjali kif ukoll il-politika kulturali. Ifisser li f’dak kollu li nagħmlu irridu nħarsu fit-tul u rridu nassiguraw li l-ħarsien ambjentali, l-iżvilupp ekonomiku u soċjali jimxu id f’id u b’rispett għall-kisbiet kulturali. Dan iwassal għal numru ta’ konklużjonijiet loġiċi li jiffurmaw il-bażi tal-politika għall-iżvilupp sostenibbli. Kienet Gro Harlem Brundtland, soċjal demokratika Norveġiża li serviet kemm bħala Prim Ministru kif ukoll bħala Ministru għall-Ambjent ta’ pajjiżha li fasslet it-triq meta fl-1987 mexxiet il-ħidma tal-Kummissjoni Dinjija għall-Ambjent u l-Iżvilupp tal-Ġnus Magħquda u ippreżentat ir-rapport intitolat Our Common Future. B’mod prattiku, l-iżvilupp sostenibbli għandu jwassal għal deċiżjonijiet konkreti li permezz tagħhom, l-iżvilupp li jseħħ ikun wieħed li jirrispetta lin-nies, lin-natura u l-kultura. Fi ftit kliem, il-profitti li tiġġenera l-ekonomija ikunu ibbażati fuq kriterji etiċi. Kien għal din ir-raġuni li sa mis-snin disgħin, meta l-iżvilupp sostenibbli issemma l-ewwel darba fil-liġijiet Maltin, dan kien responsabbiltá diretta tal-Prim Ministru. Ta’ l-inqas fuq il-karta. Għax il-politika dwar l-iżvilupp sostenibbli tmiss l-oqsma kollha tal-ħajja pubblika u allura teħtieġ politiku ta’ esperjenza. Sfortunatament l-ebda wieħed mill-Prim Ministri li kellna s’issa ma mexxa hu f’dan il-qasam għax dejjem iddelegah lill-Ministru (jew lis-Segretarju Parlamentari) responsabbli għall-Ambjent. Dan hu żball għax il-Ministru responsabbli mill-Ambjent rari ħafna jkun f’posizzjoni li jagħti direzzjoni lill-Ministri l-oħra, li ngħiduha kif inhi, ftit li xejn ikollhom interess fl-iżvilupp sostenibbli. B’eżempju forsi ninftehmu aħjar dwar kemm f’Malta, l-politika dwar l-iżvilupp sostenibbli hi biss logħob bil-kliem. Inħarsu ftit lejn l-infrastruttura tat-toroq tagħna, inkluż it-trasport pubbliku. B’mod mill-iktar ċar din mhiex sostenibbli u ilha hekk għal ħafna żmien. Marbuta mal-infrastruttura tat-toroq hemm il-mobilitá u l-kwalitá tal-arja. Dan flimkien mal-konġestjoni tat-traffiku, l-impatti fuq is-saħħa prinċipalment minħabba l- kwalitá fqira tal-arja kif ukoll l-impatti fuq l-ekonomija tal-ħin moħli fi traffiku ma jispiċċa qatt. F’Mejju 2014 l-Istitut għat-Tibdil fil-Klima u l-Iżvilupp Sostenibbli tal-Universitá ta’ Malta kien ikkummissjonat mill-uffiċċju rappresentattiv tal-Unjoni Ewropeja f’Malta biex iħejji studju dwar l-impatti tat-traffiku f’Malta. Minn dan l-istudju, intitolat The External Costs of Passenger and Commercial Vehicles Use in Malta , jirriżulta li l-impatt tal-konġestjoni tat-traffiku hu stmat li hu ekwivalenti għal 1.7% tal-Prodott Gross Nazzjonali. Din l-istima tieħu konsiderazzjoni kemm tal-petrol/diesel kif ukoll tal-ħin li jinħela bħala riżultat tal-konġestjoni tat-traffiku. Hu stmat li f’Malta kull sewwieq, kull sena, jaħli medja ta’ 52 siegħa wieqaf fit-traffiku. L-istudju iżid jgħid li din l-istima tiżdied u tilħaq l-4% tal-Prodott Gross Nazzjonali jekk jittieħed ukoll konsiderazzjoni tal-inċidenti tat-traffiku, l-impatt tat-tniġġiz tal-arja, l-effett tat-tniġġiż mill-ħoss kif ukoll il-gassijiet serra. Għall-paragun, tajjeb li nirrealizzaw li t-tkabbir ekonomiku għas-sena 2017 huwa stmat li ser ikun ta’ 3.5% tal-Prodott Gross Nazzjonali. Dan hu biss eżempju wieħed. Bħalu hemm bosta oħra. Il-loġika tal-iżvilupp sostenibbli kellha inevitabilment twassal għal servizz effiċjenti ta’ transport pubbliku snin ilu bil-konsegwenza ta’ tnaqqis sostanzjali ta’ karozzi mit-toroq tagħna. Huwa dak li għandna nippretendu f’pajjiż żgħir bħal tagħna fejn kważi kullimkien qiegħed biss tefa’ ta’ ġebla ‘l-bogħod. Imma, kollox bil-maqlub! Darba l-Kabinett kien approva Strateġija Nazzjonali għall-Iżvilupp Sostenibbli ………….. imma sadanittant il-politika tat-trasport f’Malta għadha tinkoraġixxi iktar karozzi fit-toroq tagħna. Political discourse is nowadays peppered with the terms “sustainability” and “sustainable development” but often, unfortunately, their use is out of context and thereby transmits the wrong message. So, let us first be clear as to what the terms really mean. Being in a state of sustainability means that our actions, attitudes and behaviour are such that future generations are not precluded from taking their own decisions. On the other hand, sustainable development is the path to be followed to achieve sustainability. This is not just a matter of environmental concern. 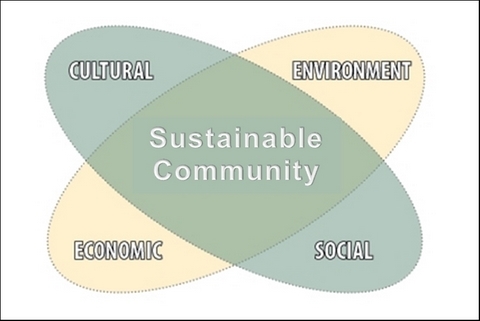 It is an intertwining of environmental, economic, social and cultural policy. It means that our actions must take the long view and be compatible with the forces of nature, the economy, human development and a respect for culture. All this leads to a number of logical conclusions which form the basis of the politics of sustainable development. This was first outlined by Gro Harlem Brundtland, a former Norwegian social democrat prime minister and minister for the environment in her seminal 1987 report Our Common Future,drawn up for the UN World Commission on Environment and Development. In her report, Brundtland, made ample use of the conclusions of an earlier debate in the World Council of Churches in 1974. In practical terms, the politics of sustainable development should lead to a number of concrete decisions, as a result of which modern-day living is simultaneously respectful of society, nature, the economy and the accumulated cultural heritage in its widest sense. Sustainable development is, in fact, a balanced approach to development. It is for this reason that, since the 1990s, when sustainable development first made it to Malta’s statute book, it was retained (on paper) as a direct political responsibility of the Prime Minister. Sustainable development permeates all areas of policy and hence requires a senior politician in Cabinet to be in charge. Unfortunately, not even one of our prime ministers assumed direct political responsibility for the matter as, formally or informally, all of them delegated the matter to the Minister (or Parliamentary Secretary) responsible for the environment. The Minister responsible for the environment cannot make much headway as he is dependent upon – and can in no way can he be expected to direct – his cabinet colleagues, most of whom are not really interested in sustainable development, anyway. A simple example will illustrate how all the talk on sustainable development by governments in Malta has been an exercise in managing hot air. Consider the management of Malta’s road infrastructure, including public transport. This is clearly unsustainable and has been so for a long time. The public transport reform carried out under the direction of former Minister Austin Gatt was a public disservice as it made a bad situation even worse. The management of Malta’s road infrastructure brings to the fore a number of issues, including mobility and air quality. Linked to these are traffic congestion, health impacts primarily due to poor air quality and the impact of the clogging of our roads on our economy through a substantial amount of time spent fuming at our steering wheels. In May 2014, the Institute for Climate Change and Sustainable Development of the University of Malta was commissioned by the European Union representation in Malta to carry out a study on the external costs of traffic and congestion in Malta. Among other things, this study, entitled The External Costs of Passenger and Commercial Vehicles Use in Malta, estimated that 1.7 per cent of Malta’s GDP is wiped out annually as a result of traffic congestion. This conclusion took into consideration both fuel wasted and time lost: approximately 52 hours per annum per commuter. This is just one example. There are many more. The logic of sustainable development would have inevitably led to an efficient public transport system ages ago and a substantially reduced number of cars on our roads. It is what one would expect in a small country where practically everywhere is within a stone’s throw of everywhere else. Yet we get the complete opposite. Once upon a time, the Cabinet had approved a National Strategy for Sustainable Development – yet Malta’s transport policy is still one which encourages more cars on the road. Mela fl-aħħar, il-lejla, l-Parlament ta’ Malta għandu fuq l-aġenda bħala l-ewwel item l-abbozz ta’ liġi li jirregola l-imġieba fil-ħajja pubblika. Wara li dan l-abbozz ilu lest iktar minn sentejn hu ġustifikat li ngħidu “about time”. Jew forsi “aħjar tard milli qatt”! Ir-rapport finali tal-Kumitat Magħżul kien ippreżentat lill-Parlament nhar l-24 ta’ Marzu 2014. Xahrejn wara, nhar l-20 ta’ Mejju, l-abbozz ta’ Liġi imsejjaħ Att tal-2014 dwar l-Istandards fil-Ħajja Pubblika ingħata l-ewwel qari fil-Parlament. Wara, nhar il-15 ta’ Lulju 2014 kien ippubblikat fil-Gazzetta tal-Gvern u tqiegħed fuq l-agenda tal-Parlament fejn għandu hemm sal-lum! L-abbozz ta’ liġi jfittex li joħloq l-istrutturi meħtieġa biex ikun possibli li jkunu investigati imġieba li ma tkunx kompatibbli mal-liġi inkella man-normi etiċi minn persuni fil-ħajja pubblika. Il-moniteraġġ ser ikun vestit f’kumitat parlamentari permanenti kif ukoll f’Kummissarju għall-Istandards fil-Ħajja Pubblika li jinħatar bl-approvazzjoni ta’ żewġ terzi tal-voti tal-membri parlamentari. Il-leġislazzjoni proposta ser tapplika għal żewġ kategoriji ta’ persuni fil-ħajja pubblika: il-Membri Parlamentari (inkluż il-Ministri, s-Segretarji Parlamentari u l-Assistenti Parlamentari) kif ukoll dawk impjegati fis-settur pubbliku minħabba li jgawdu l-fiduċja tal-politiċi, dawk li ħafna drabi nirreferu għalihom bħala li qegħdin “in a position of trust”. L-abbozz jinkludi edizzjoni aġġornata tal-Kodiċi tal-Etika applikabbli għall-membri parlamentari kif ukoll għall-Kodiċi l-ieħor applikabbli għall-membri tal-Kabinett imma ma jinkludix il-Kodiċi tal-Etika applikabbli għad-Diretturi maħtura fuq awtoritajiet, korporazzjonijiet jew korpi parastatali li kien oriġinalment ippubblikat madwar ħamsa u għoxrin sena ilu. L-abbozz l-anqas ma jgħidilna dawn il-persuni ta’ fiduċja kif ser ikunu regolati! Il-Kummissarju għall-Istandards fil-Ħajja Pubblika ser ikun jista’ jinvestiga allegazzjonijiet dwar imġieba mhux etika kif ukoll dwar il-veraċità tad-dikjarazzjonijiet tad-dħul u l-assi li jagħmlu l-Membri Parlamentari, u l-membri tal-Kabinetti jew dawk impjegati f’posizzjoni ta’ fiduċja u dan skond kif jistabilixxu l-Kodiċi tal-Etika inkella r-regoli li jsiru taħt l-Att dwar l-Amministrazzjoni Pubblika. Għalkemm l-abbozz huwa avvanz fuq il-qagħda attwali xorta hemm ħtieġa ta’ titjib sostanzjali fil-proposti li fih l-abbozz. Fosthom huwa neċessarju li jidħlu għall-ewwel darba miżuri li jirregolaw il-lobbying illi jsir tal-politici f’laqghat kemm formali kif ukoll informali. Regolamentazzjoni illi tista’ issir b’diversi modi. Imma l-abbozz jinjora l-lobbying kompletament u ma jippruvax jirregolah. Huwa essenzjali li issa l-Parlament ma jkaxkarx saqajh u li l-abbozz ikun approvat b’emendi fl-iqsar zmien possibli. Kien hemm diversi kazi u ċirkustanzi matul dawn l-aħħar sentejn li setgħu jkunu investigati kieku liġi ta’ din ix-xorta kienet teżisti. Huwa għalhekk essenzjali illi l-abbozz ikun imtejjeb u approvat u li fl-qasir żmien jinħatar il-Kummissarju ghall-iStandards fil-Ħajja Pubblika. Għandu jkun emfasizzat li l- Kummissarju għall-iStandards fil-Ħajja Pubblika għandu l-inkarigu li jinvestiga mhux biss l-imġieba tal-Membri Parlamentari u l-Ministri imma ukoll, kif jipproponi l-istess abbozz, l-imġieba tal-persuni ta’ fiduċja li nħatru mill-amministrazzjoni. Huwa mehtieg li anke dawn jirrealizzaw illi anke huma jeħtieġ li jagħtu kont ta’ egħmilhom. It-tradizzjoni politika Ewropeja, li f’kull partit politiku jkun hemm mhux biss min jaħseb b’moħħu imma, iktar minn hekk li jkun hemm min jitkellem ċar fil-pubbliku, għad ma rabbietx l-egħruq fil-fond f’pajjiżna. Kieku dan seħħ, il-ħajja politika f’Malta forsi hi ftit aħjar. Minflok politiċi li jitkellmu ċar, għandna l-parabboli ta’ Varist li waqt li l-opinjoni pubblika qed tiffoka fuq il-Panama jippreferi jikkritika l-imġieba tal-Professur Bannister inkella li jitkellem dwar xi stedina għal fenkata f’razzett fin-nofsinnhar tal-pajjiż. Messaġġ għal min irid jifhmu, imma ferm il-bogħod minn dak mistenni minnu. Jiena nitkellem ma membri parlamentari miż-żewġ naħat tal-kamra. Wieħed minnhom, min-naħa tal-Gvern, riċentement qalli li Marlene Farrugia għaġġlet meta rriżenjat għax kieku stenniet ftit kienet issib appoġġ mhux żgħir mill-backbench. Iva, wara l-istorja faċli tgħid x’seta ġara, kieku …………… nitkellmu ċar u mhux bil-parabboli. Imma dan ma ġarax b’kumbinazzjoni għax tajjeb li niftakru li Joseph Muscat ħaseb minn kmieni biex jassigura ruħu li jkun jista’ joħnoq id-dissens fil-grupp parlamentari biex jipprova jevita dak li ġralu Lawrence Gonzi. Id-daqs kbir tal-Kabinett (l-ikbar fl-istorja) kif ukoll l-inkarigi lil prattikament il-backbench kollu (min Chairman hawn u min konsulent hemm) huma fost il-miżuri intenzjonati minn kmieni biex id-dissens ikun regolat. Pero minkejja dan, il-grupp parlamentari laburista xorta kellu diskussjoni imqanqla dwar il-Panama Papers. Kien hemm min, bil-bibien magħluqin ħass li seta jkun kritiku ta’ kif saru l-affarijiet u diversi talbu r-riżenji ta’ Konrad u Keith. Il-kuraġġ tal-ftit instema imma ma kienx biżżejjed. Kellhom il-kuraġġ imma illimitaw ruħhom għall-kritika interna, li hi neċessarja ukoll. S’issa d-dissens fil-Partit Laburista hu limitat għall-kritika interna u għall-parabboli ta’ Varist. Żewġ passi l-quddiem imma mhux biżżejjed biex tinkiseb lura l-kredibilità.